As some of you will know, my financial situation isn't the best - quite frankly, without you, I couldn't do any reviews at all. As in: "I'm working all day to scrape by." The patreon literally keeps the lights on right now. While my business-trip to Copenhagen and job application there and at other places (as some of you may know, I've been pretty busy in that regard) *may* remedy that situation, for now, my resources are incredibly stretched; they have been so for quite some time and I'm working hard to change that fact. I don't really talk much about it or advertise much of that aspect of my life since frankly, I'm ashamed of being poor in spite of my qualifications. 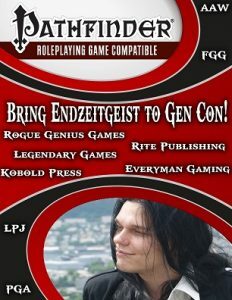 There's a colossal bundle of AWESOME books gathered together by publishers, authors and friends with one goal: To make it possible for me to actually attend Gencon. The flight is far beyond my capabilities to afford; same goes for the other components associated with attending. It's a long shot, but guess what? You have nothing to lose and the bundle contains some of the most glorious books out there! And yes, when I got back from my trip and saw this, I actually teared up! you can get on them here! If you just want to get me to Gencon and don't care about those awesome books (or already have them), you can actually donate for this express purpose here on OBS via Pay what you want - please, before you do or don't, though: It is *you* fine people that allow me to keep my reviewing up; I don't expect anything from you and the only reason I post this here as well is that the bundle is a superb deal that may benefit those of you who are still missing some of the gems in the bundle. My true, heartfelt and humble thanks go out to all of you, every months and frankly, I wish I could do even more for you. I am not engaging in hyperbole when I say that it would be a pleasure to meet each and every one of you. Thank you for your support. You are literally what keeps endzeitgeist.com alive and kicking. I'd certainly love to game, talk shop, etc. with you all and talk to you fine folks in person and this may be an actual shot at this, at least for some of you! Thank you for reading this. And to all the publishers that contributed to the bundle and everything -I'm absolutely blown away. Words fail to properly encapsulate what I'm feeling right now. Roleplayers are simply stellar people. Thank you.